Open concept living room with modern kitchen. 1 bed, 1 bath, 1 den on the round level with 2 good-sized patios. Kitchen with stainless steel appliances, new quartz countertops and backslash. Stone tiles in the bathroom; high-endwasher and dryer. 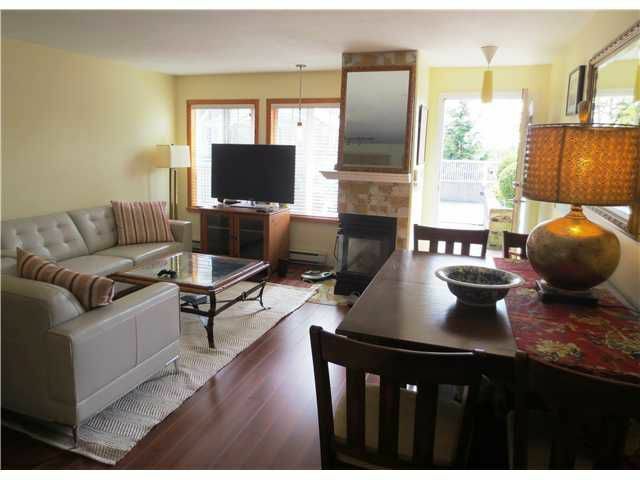 Low strata fees (gas fireplace included). Close to everything: 5 min walk to supermarkets, Starbucks, restaurants, SkyTrain, Landmark Theater, banks. Upgrades: laminate flooring in 2013, stone tiles and sink cabinet, wall cabinet in the bathroom in 2013, brand new window blinds and screens in 2015, brand new quartz kitchen counter-top and backslash in 2015, Italian porcelain tiles in 2010 and much more. Nothing to do but move in. Priced $24000 below assessment.